The haze grey cloudy sky is filled with Buzzards lately. I think the Chinese New year folks got it wrong. This is the year of the Buzzard…not the horse. I also heard they were having another Blizzard in Massachusetts this past week. Weather and other circumstances also prevented my planned excursion Beyond the Broward this month. The sun has been barely visible this week! And I got the Blues! It is so hard to do decent photography without some sunlight. But come rain or shine there are a few faithful fowl out there each day. So we try our best. On the one day of sunshine, I walk out the back door after supper and head to the dock. As I look up I see a Bald Eagle flying towards me. An instinctive reaction with my finger on the doohickey is the only thing that captures that moment. The majestic bird continues in the direction of the nest. In order to confirm my identification, I follow it and get a photograph in the vicinity of the nest. An examination the photos confirm that this is the same female adult. While going back over some older photos I also conclude that this eagle has been in the area at least since early September. Later back on the river I spot my little Tricolored Heron friend a few feet away patiently watching for minnows. As the sun sets it flies to the pole above my head. In a close up crop of the photo can you actually see the reflection of the sunset in its eye. But that was about the last time either of us saw the sun. Regardless of the skies, spring is in the air on the Broward. Old Man River the Great Blue Heron is seen high in one of the trees in a courting display for his mate before flying off for another adventure. The breeding colors are showing on the Great Egrets and the other heron species also. Spring also means crab season and I see George, the Yellow Crowned Night Heron, feasting on a small blue crab sandwich on the bank. While searching near the zoo, a Roseate Spoonbill goes winging by. Can’t wait to see them on the river. Those bright pink wings certainly light up any day. Hey, who turned out the lights? A majestic Bald Eagle , I mean BALD BUZZARD soars right over me on the dock. Now a majestic Bald Eagle soars over me on the dock! This is the same female adult eagle near the nest. Photo comparisons confirm the identification. 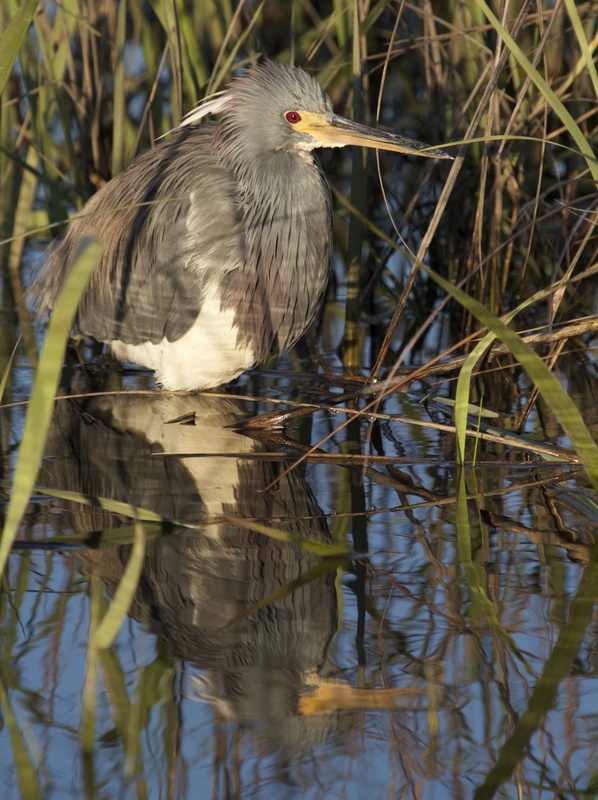 The Tricolored Heron patiently waits for minnows! I can see the sunset reflection it the Tricolored Heron's eye! The last one we saw that is. George, the Yellow Crowned Night Heron enjoys a Crab sandwich. A Green Heron is also spotted, first sighting of the Spring. 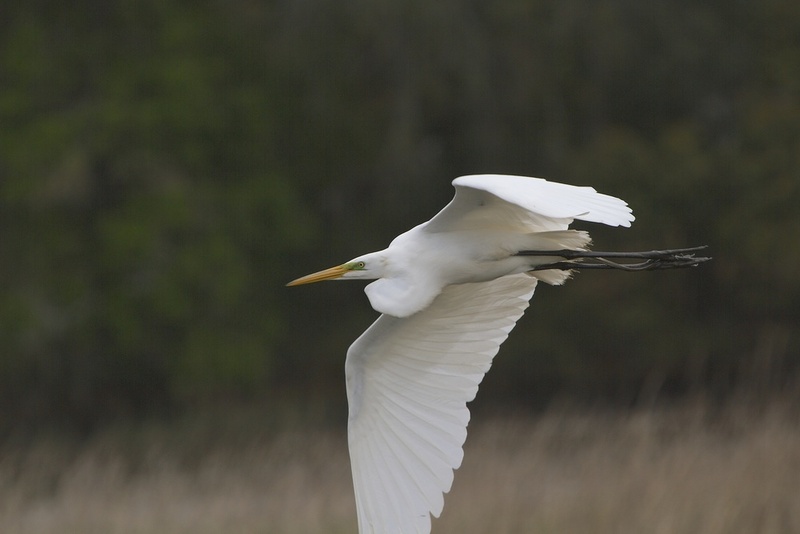 The Great Egret is showing breeding colors of Green around the eyes. The Little Blue Heron's beak is also turning breeding blue. Waiting for the sun, and breakfast. Seen any sunshine up there lately? There ain't no sunshine in my eyes is there now? We still have some blowing "snowys" on the Broward but no Blizzards.